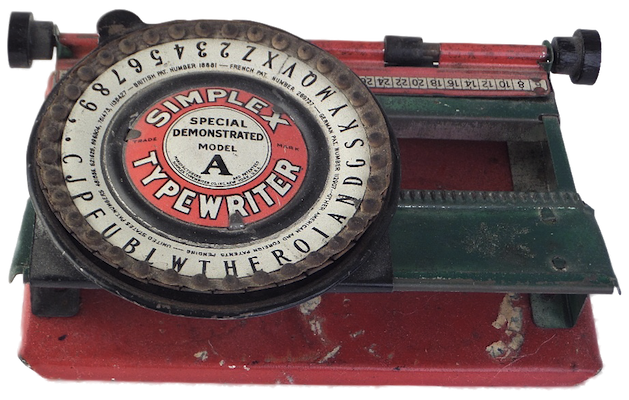 I must confess that when I purchased this Simplex typewriter on eBay, I thought it was much larger — large enough to accommodate a full sheet of paper. It’s not. It’s only a few inches wide, and it’s made of tin — more a toy than a tool. That said, I am not disappointed. Included with the item were the box, some ink refills, and a few typing samples. I especially appreciate the typing samples. 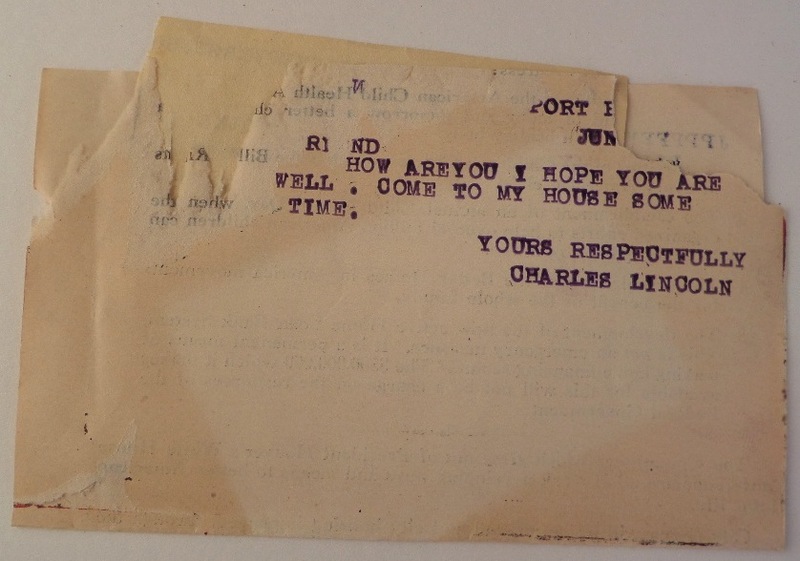 What a sweet piece of typing ephemera! But, oh, how I despair when I consider what has become of the personal note. No more do we take the time to compose, but rather we send. We do not greet one another by name, we do not make inquiries, we do not sign with “sincerely” or “yours truly.” What matters most is the message, not the person with whom we are communicating. We “friend,” we “like,” we “update,” but we do not engage. Sometimes I wonder what words are for. I remember the first time I was allowed to make a phone call. It was a rite of passage: dialing the number, asking to speak with so-and-so, engaging in a conversation. It was awkward, I was nervous, but it was important step toward social maturation. I was learning to communicate. How are you? I am fine. Please come by my house to play. In writing that letter, I learned to engage another person through vicarious communication. I learned to shift the focus from me to that person. Today, only by force of will do I begin e-mails with “Dear [so-and-so]” and close with “Sincerely.” More often than not, I open with “Hey there” or “Hello,” and close simply with my name, no declaration of fidelity. This is neither sophisticated nor personal. And, sadly, the trend is to eliminate the greeting all together. Just say what you have to say. I don’t know much about index typewriters, but one has taught me an important lesson. Thank you, Charles Lincoln, wherever you are. I hope you are well. I also feel a bit regretful whenever I start an e-mail with the typical “Hi X,” and end with “best, Richard.” At least I use “hi” and “best,” instead of just the plain names or no names at all. A very moving account. Thanks for the link. Robert Messenger writes considerably on the Simplex typewriter; I find his posts on the subject very interesting: http://oztypewriter.blogspot.com/search?q=simplex.